5 part of it, its celebration of blacklight art. That is why the next edition takes place shortly after new moon. In this way, the vast string art sculptures and the new Blacklight Park really light up. Also another epic festival in Germany reaches its majority: VuuV is held for the 21st time. Of course these are only two prominent examples from the rich open air summer in North-East Germany. In this region, there is also a festival debut that breaks new grounds in terms of entertainment and inspiration: Organized by the former Full Moon team plus a bunch of other activists, Freqs of Nature announced an art gallery, lectures and even an adult playground- see the extensive interview in this issue. These keywords give rise to the idea of yet another highlight: Boom in Portugal. After the legendary 2010 edition anticipations are very high. 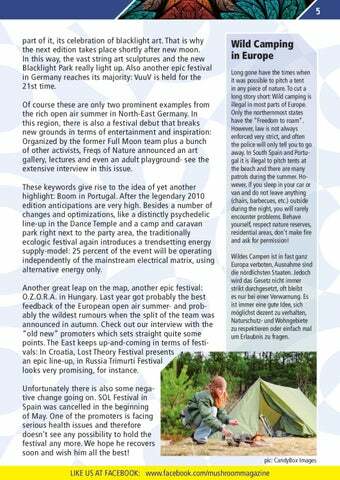 Besides a number of changes and optimizations, like a distinctly psychedelic line-up in the Dance Temple and a camp and caravan park right next to the party area, the traditionally ecologic festival again introduces a trendsetting energy supply-model: 25 percent of the event will be operating independently of the mainstream electrical matrix, using alternative energy only. Another great leap on the map, another epic festival: O.Z.O.R.A. in Hungary. Last year got probably the best feedback of the European open air summer- and probably the wildest rumours when the split of the team was announced in autumn. Check out our interview with the “old new” promoters which sets straight quite some points. The East keeps up-and-coming in terms of festivals: In Croatia, Lost Theory Festival presents an epic line-up, in Russia Trimurti Festival looks very promising, for instance. Unfortunately there is also some negative change going on. SOL Festival in Spain was cancelled in the beginning of May. One of the promoters is facing serious health issues and therefore doesn’t see any possibility to hold the festival any more. We hope he recovers soon and wish him all the best! Wild Camping in Europe Long gone have the times when it was possible to pitch a tent in any piece of nature. To cut a long story short: Wild camping is illegal in most parts of Europe. Only the northernmost states have the “Freedom to roam”. However, law is not always enforced very strict, and often the police will only tell you to go away. In South Spain and Portugal it is illegal to pitch tents at the beach and there are many patrols during the summer. However, if you sleep in your car or van and do not leave anything (chairs, barbecues, etc.) outside during the night, you will rarely encounter problems. Behave yourself, respect nature reserves, residential areas, don’t make fire and ask for permission! Wildes Campen ist in fast ganz Europa verboten, Ausnahme sind die nördlichsten Staaten. Jedoch wird das Gesetz nicht immer strikt durchgesetzt, oft bleibt es nur bei einer Verwarnung. Es ist immer eine gute Idee, sich möglichst dezent zu verhalten, Naturschutz- und Wohngebiete zu respektieren oder einfach mal um Erlaubnis zu fragen.